How to Use the Roland Integra-7 with Your iPad. Roland's Integra-7 iPad editor can make life much simpler for any Integra-7 owner, though it is not without a few bugs. The editor allows you to quickly move from one set to the next, choose individual tones for each part, and change your mix. You can even edit supernatural synth tones and modify the motional surround setting. But you'll have to live through a few (not frequent, but not rare) crashes. The app is available for free on the App Store, making it a simple process to get it downloaded and installed. Roland offers two ways to connect to the Integra-7: Through USB or through Wireless. While connecting wirelessly means you can keep your iPad plugged in and charged up, it is also the most unstable way to connect, so you won't want to go wireless when performing live. You'll also need Roland's wireless adapter, which is around $50. To connect via USB, you'll need Apple's camera connection kit, but since this is the best way to connect MIDI instruments to the iPad, most musicians will want this adapter anyway. (Remember to get the right adapter for your iPad, with iPads released since October 2012 using the new Lightning adapter). To communicate with the Integra-7, you need to plug the iPad into the USB connection on the back. Once connected, you simply launch the app, tap the settings button (shown in the diagram above). First, turn the app mode from Demo to Normal, otherwise, the app won't connect to the sound module. Next, choose "MIDI Devices" from the list. This will open up a new window where you can choose the Integra-7. Once you have selected the Integra-7, close these windows by tapping anywhere outside the window and then tap the "Read" button to read the current settings from the sound module. The editor makes it easy to switch studio sets, parts, and tones. You can choose a new studio set from the drop-down on the upper left side of the editor. Remember to tap on the down button, not the studio set name. Tapping on the name allows you to edit... the name. Not exactly user-friendly. You'll mainly be switching between two modes: mixer mode and choosing a new tone. The mixer mode is awesome because not all sounds are created equal in the Integra, and you'll always want your primary tone to stand out a little. You can choose tones from the drop down, but it's easy enough to just hit the tone select button at the top of the screen. The motional surround mode is pretty cool if you are using surround sound. You simply drag your sounds around the screen, pinpointing where you want the sound to originate. Each part has an icon, it's name and the number of the part, so it is easy to recognize which sound is which. You can also modify the reverb via the "Room Type" knob. Remember to push the Motional Surround button on the right to enable motional surround mode in the Integra. The only tones you can edit are the supernatural synth tones, which is too bad. It'd be nice if you could modify some of the other supernatural settings like strum mode for guitars, and even better, fully edit sounds via the iPad app. But for now, you are limited to synth tones. The last major feature of the editor is the ability to load expansion sounds. 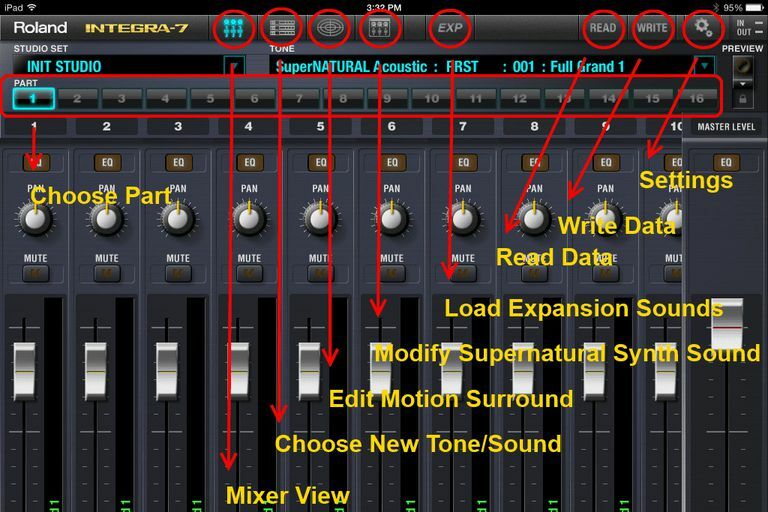 The Integra-7 has four virtual expansion slots, and the editor gives you a visual way to load the SRX, ExSN, and ExPCM sounds into the sound module. And because they are labeled, you don't need to refer to a chart to match SRX number with the actual expansion you want to load. Remember: If you make any changes you want to keep, you need to hit the Write button. If you leave your keyboard long enough for the iPad to go into sleep mode, you will need to re-connect it to the sound module. This is done by going into the settings, choosing MIDI Devices and choosing the Integra-7. It's also a good idea to hit the Read button again to make sure the settings are properly loaded. Most crashes are fixed by just booting back into the app, but if you find the app crashing over and over again at the exact same point, such as immediately after hitting the Read button, you will need to reboot the iPad. You can also access the Integra-7 manual from the settings. This is great if you want to look up how to do something on the sound module.